BEIJING, March 1 (Xinhua) -- China has met all its annual development targets set in last year's government work report, the State Council said Thursday. 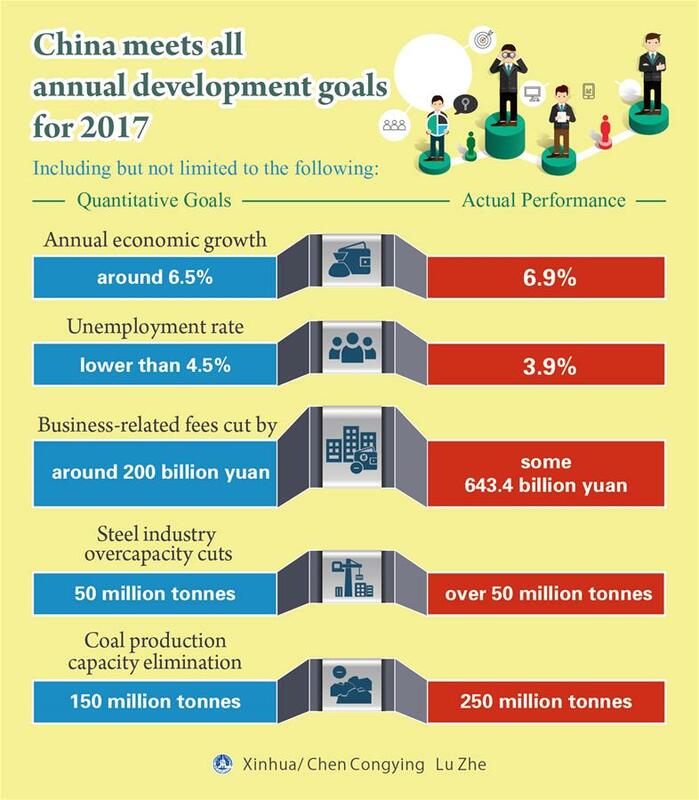 The 36 quantitative goals for 2017, including annual economic growth of around 6.5 percent, were accomplished perfectly, according to a State Council report tracking the progress of last year's government targets. China's economy expanded 6.9 percent year on year to 82.71 trillion yuan (about 12.8 trillion U.S. dollars) in 2017, higher than the 6.7-percent growth registered in 2016, official data showed. With faster economic expansion and a better employment picture, China's per capita disposable income grew 7.3 percent last year. Meanwhile, the Engel's coefficient, which measures food expenditures as a proportion of total household spending, dropped to 29.3 percent in 2017, down from 30.1 percent in 2016. Last year also saw the quickened pace of industrial overcapacity cuts, with the steel industry outperforming the annual target of cutting 50 million tonnes of capacity. A total of 250 million tonnes of coal production capacity was also eliminated, compared with the goal of 150 million tonnes. New development targets for 2018 are expected to be released in this year's government work report during the upcoming annual sessions of the top legislative and political advisory bodies as the country seeks economic transformation toward high-quality development.